I spent the last three days in Valley, AL at the 2016 Millard Fuller Legacy Build. I left the build yesterday feeling a wide range of emotions: sadness for leaving mid-week, fulfillment for what we had accomplished in just three days, and largely challenged for a reason I could not quite pinpoint. After taking a step back and realizing why it was I was so deeply challenged, I recognized that it was because I thought I already knew it all, and this week proved that quite simply, I knew very little. I thought I knew about community, welcoming people, and diversity in action, but this week’s experiences broadened my knowledge in every way. After two years spent with the Fuller Center Bike Adventure, I was surely not short on these types of experiences, but I had never seen them on this scale, and it has made all the difference. I thought I knew how beautiful it was to see a community come together, opening their arms and embracing those visiting the place they call “home.” The people of Valley exceeded any expectations I could have had. Between the first responders keeping us safe and putting in work on homes, various churches providing us with delicious meals, the community center allowing us the use of their facilities and a place to sleep, the cheer spread by Valley High School, and the donations from local businesses, I could not have been more blown away by the town of Valley. I thought I knew how emotional it was to watch a homeowner work on their own home, learning about themselves and the world around them simultaneously. I had the distinct pleasure of interviewing LaTonya, Cashaundra, Max, and Robin, four of the homeowners the Fuller Center is working with this week. These four individuals all had such beautiful stories to share, and while my time with them may have ended, the images of them in the midst of their hard work will stick with me forever. I thought I knew how enchanting it was to see people of diverse background form an instant community through working towards a common goal. Community is always an incredible thing, but it was exceedingly so this week. I witnessed people who were strangers only a few days ago pray together, work together, and support each other through every moment of the day, especially the tough ones. The hard moments were nothing but bonding opportunities for the volunteers we had this week. I have nothing but thanks for every single one of them, as they played a role in proving the beauty of humanity to me in a time where that is quite easy to lose sight of. I thought I knew what to expect of inmates: very little, if anything at all. Instead, I watched as a crew of inmates from the local jail dedicated themselves to the cause, working as hard as they possibly could, and proving that they are far more than I had allowed myself to realize. They revealed to me stereotypes that I didn’t even realize I had, and I am thankful to them not just for challenging them, but for shattering them. Every single one of those young men impressed me beyond belief, and I am glad to call them friends. Finally, I thought I knew how much I loved the Fuller Center for Housing. It turns out, that love has no limit, and I can only expect it to continue growing as I continue experiencing extraordinary moments through this ministry. I am unbelievably grateful for a week full of growth, learning, expanding my limits, and everyone who played a role in it. To the 2016 Millard Fuller Legacy Build, and all that it taught me: Oyee! 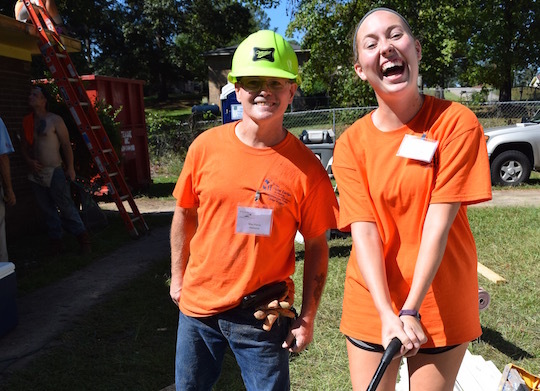 Jessica, thank you for sharing your experiences at the Fuller Legacy Build last week. Well done!! It was a pleasure seeing your joy and good work throughout the week. I am glad you are on The Fuller Center Communications Team! God bless you.